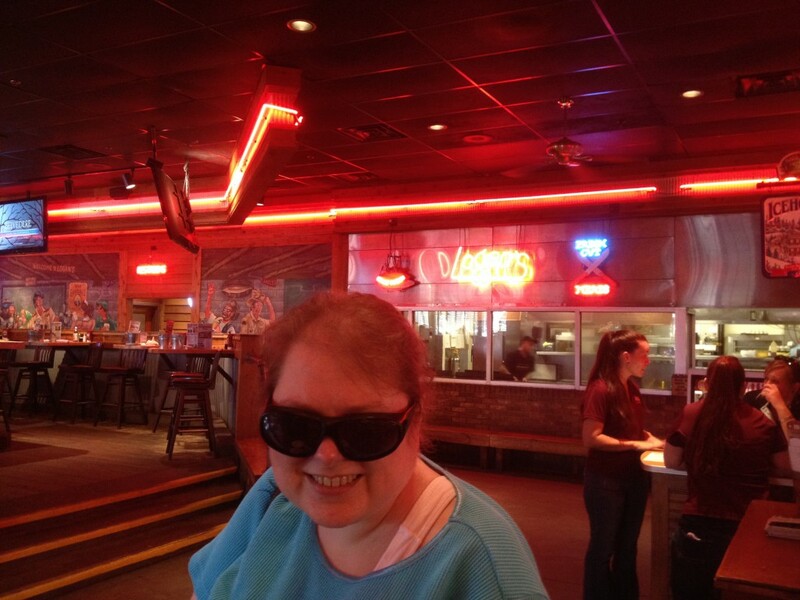 Kimbra in the “Logans” restaurant in Evansville. After checking out from our hotel, Kimbra and Darren met us at the parking lot, and I, Erika and Cindy followed them to the Evansville Public library. It was very impressive, and they really had all kinds of books from facts to fiction, plus a wide selection of DVDs and CDs. What surprised me the most, however, is that the translated version of the Swedish author Fredrik Backman’s book “En man som heter Ove” (A Man Named Ove) was placed on display on the primary shelf, by the entrance! Kimbra borrowed it right away, after I recommended it. Later, we headed out for lunch to a place called “Logans” which is a very American styled restaurant chain where you can eat as many peanuts as you like before you order. 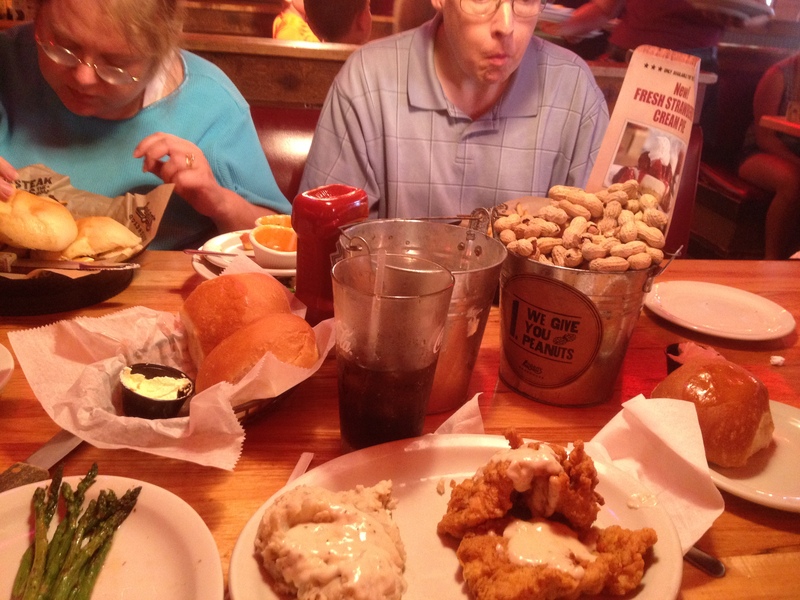 (After your meal, you’re WAY too full… 😉 ) Some Logans restaurants actually encourage you to just throw the peanut shells on the floor, but this one actually had waste buckets. 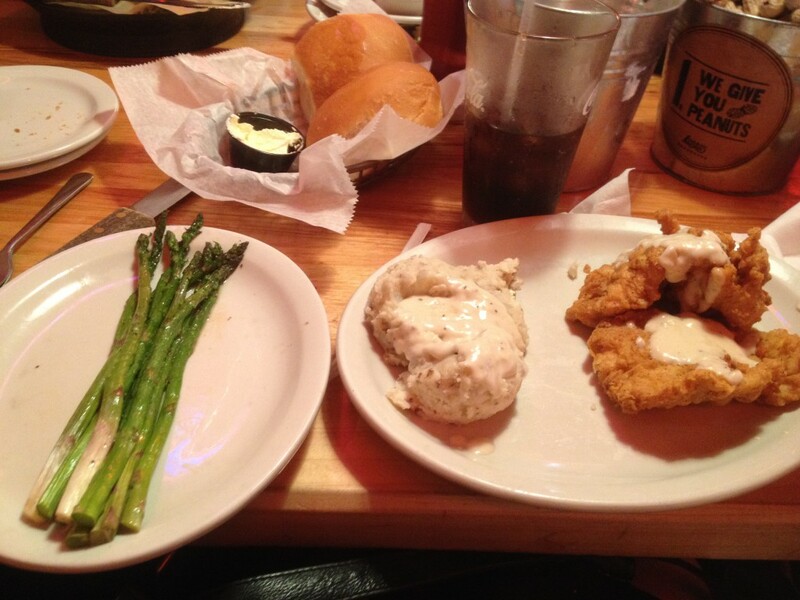 I ordered one of their special chicken dishes with asparagus on the side, and mashed potatoes. It was really, really nice. No “just-add-water” stuff but real lumps of tasty potatoes in a creamy, fluffy mash. After finishing our meal, we had to say goodbye to Kimbra and Darren. I really had an awesome time down here in Kentucky and I so wish we could have stayed even longer. It certainly won’t be eleven years until next time!!! 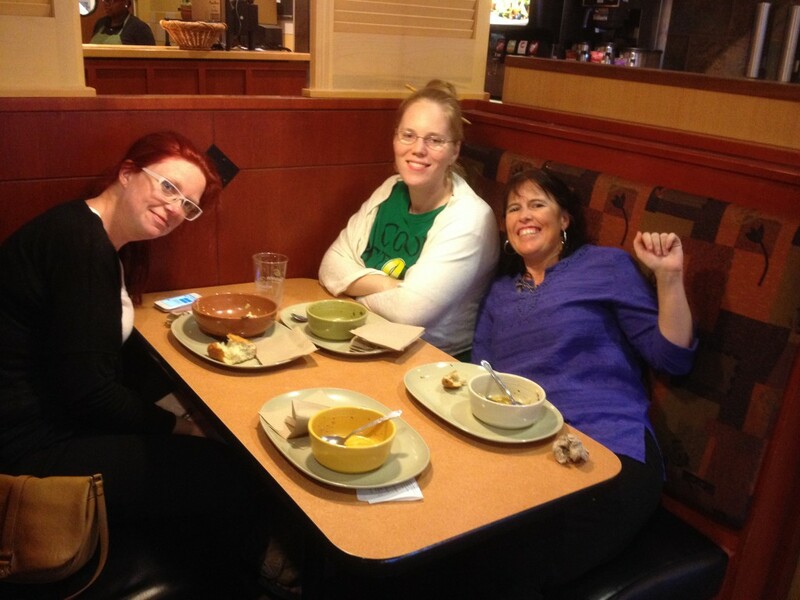 Erika, Cindy and “Claudia” at the Panera restaurant in Champaign. On the road again, we were heading back north, once more towards Chicago. At dinnertime, we stopped at the Panera restaurant in Champaign to have dinner with another mutual friend from the Lord of the Rings fandom, known there as “Claudia.” It was a very happy reunion! Claudia should also be known as the woman with the most contagious smile, and I was so glad to see her again. Unfortunately we couldn’t stay for long, since we still had a rather long drive ahead of us to our Chicago hotel. Selling instant mashed potatoes in a restaurant should be banned anyway. Once more reviving the blog!